People put a lot of effort into making it clear that not everyone in the majority group is a problem. But what about internal biases and the benefits of privilege? Kat Blaque’s breaking down how you’re missing an important part of being an ally when you perpetuate these messages. I follow a page called Lizzy the Lezzy and recently, they decide to post this screenshot from Tumblr. Now, some of you might be familiar with this picture. It’s sort of gone viral, but for those of you guys who aren’t, this is what is says. Now, while I understand where this post is coming from, it bothers me and here’s why. 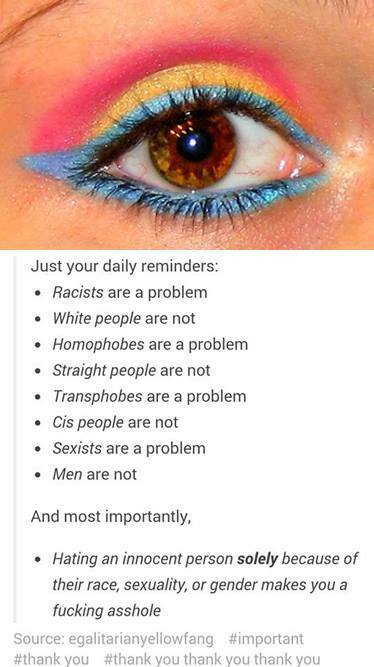 While it’s true that white people, cis people, straight people, and men are not “the problem,” people who fall under all of those categories can still maintain internalized biases without realizing that they’re doing so. Whether or not a white person is or isn’t racist, they benefit from the white supremacy that was established before they were born. And that system of white supremacy gives them privilege in this society. Straight people are not responsible for homophobia, but straight people can perpetuate heteronormativity that does alienate people whose relationships are not that way. A pro-gay person can still turn to a gay couple and ask them, “Who’s the man and who’s the woman in this relationship?” Because they were socialized to believe that in romantic relationships, there must be someone who plays the “man’s” role and there must be somebody who plays the “woman’s” role. Cis people, whether they like it or not, benefit from cissexism that harms trans people. There are cis people who call themselves an ally to the trans community who will only respect the trans girl’s pronouns once she’s had “the surgery.” Cis people also benefit from the gender binary that can and does erase many people’s lived experiences and identities. Men benefit from the sexism that considers women to be less capable. Politically, they may be strongly opposed to sexism. But regardless of how they feel, they will continue to benefit from it and their voices will still be seen as superior. You don’t have to go any further than the mainstream LGBT community to see that cisgender, white, heteronormative men are still seen as the leaders of the acronym, despite the fact that trans women of color have been on the ground floor. And this is because of systems that have been established that viewed them as the referred group. While yes, this graphic isn’t untrue, it’s also rejecting the responsibility that all of these groups have to calling out their own internal biases. Being an ally means having to actively work to de-program these biases that you were socialized with that you might not agree with but still have. This post honestly is just a response to people like myself who criticize these systems but are misinterpreted as hating the people who benefit from them. This conversation is never about hating white people, hating cis people, hating straight people, or hating men. They’re always about systems that are in place that benefit these groups that ultimately alienate the people that are on the outside. There are a lot of people who call themselves allies who are celebrating this post and saying that they’re just so tired of minorities blaming entire groups for their struggles. People who are part of majority groups tend to believe that because they have access to something, that everyone must as well. But how would you know what a trans person needs access to when you’re not trans? How would you understand how cis people maintain a structure that harms trans people? How would anyone of a majority group be able to understand how their actions can harm a minority group? The answer is by listening and recognizing that these conversations are about systems that maintain certain biases, and not every person who benefits from them. As an ally, it’s your job to be an active listener. And when you recenter the conversation on you, you perpetuate the problem. We should not be protecting the egos of a group of people who are part of a normative society that has never once told them that they aren’t valid. In this country, there is no structure that systemically oppresses white people. We do not live in a society where cis people have to debate their gender and fight to have it recognized socially, legally, and medically. And we don’t live in a society where straight people face hatred and violence exclusively for their sexual orientation. As a singular person, you are not responsible for the history that has validated these biases. But you can absolutely perpetuate them and fight to maintain them without being aware. So it’s important to call out your own internal biases. Because at the end of the day, you’re not helping anyone if you’re maintaining hurtful structures while claiming to be against them. So what do you guys think about this post? Let me know in the comment box below. As per usual, always remember and never forget that you are beautiful and you are loved. Bye.